We wrote about this back in May ('Deflection - is it becoming an epidemic?') but since then the evidence has been piling up at such a rate that we need to revisit this important subject. 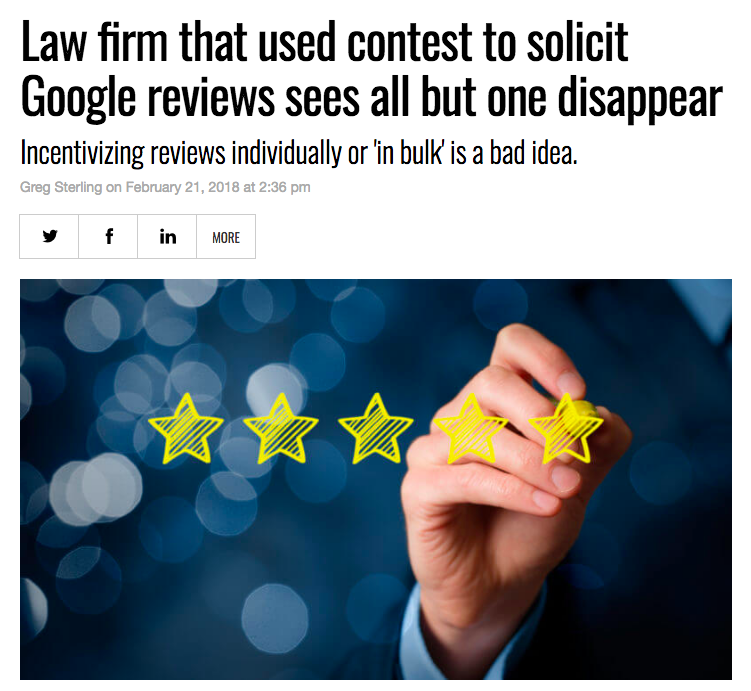 It is the unintended consequence of focussing review efforts on a reviews site rather than Google. 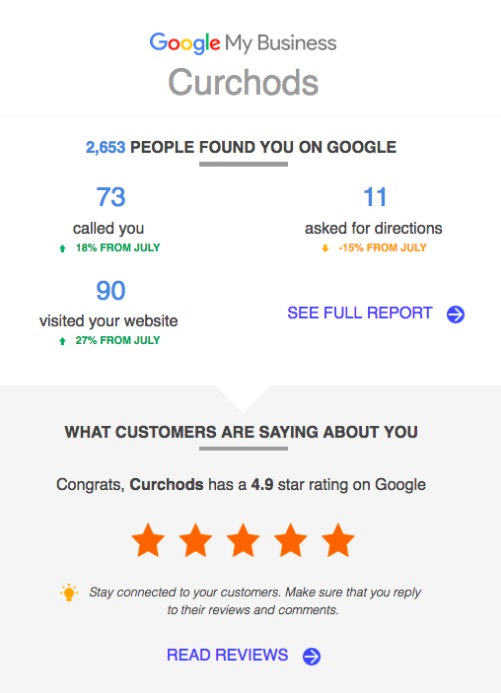 It results in the business looking good on the reviews site and less good - often a whole lot less good - on Google. Because consumers have got wise to Google - and its power to influence their fellows. 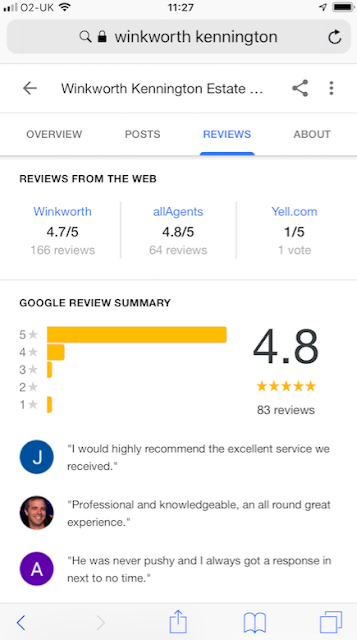 So when a business invites them to write a review to the reviews site of the business's choice they do write a review, but to Google instead - especially if they are unhappy with the service they have been given. 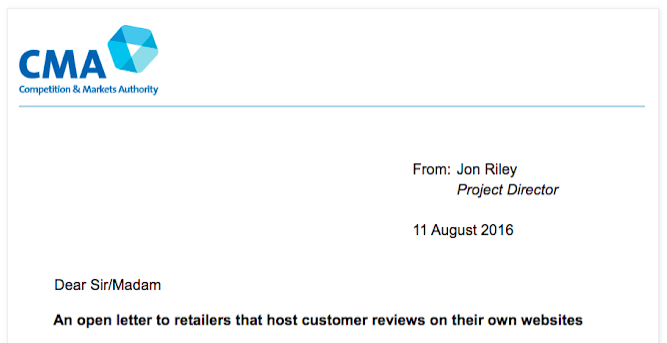 This is exactly what we term 'deflection' - the business's happy customers doing as they are asked (writing a review to the business's reviews site) and a significant proportion of the unhappy customers - invited or not - writing their review to Google. ...and, unlike Facebook, where personal friends will 'like' a comment or review simply because of that friendship, with Google the 'liker' will almost certainly be a potential customer of the business under review. 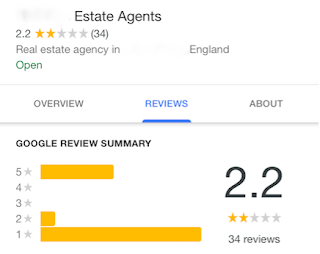 *An exception to the rule is the 'clever' business that invites customers to post reviews to a reviews site and then only invites those that rated it five stars to copy their review to Google. Not only is that against the T&Cs of both the reviews site and Google - it is against the law (if you need to brush up on the law relating to reviews there's a link at the bottom of this article). 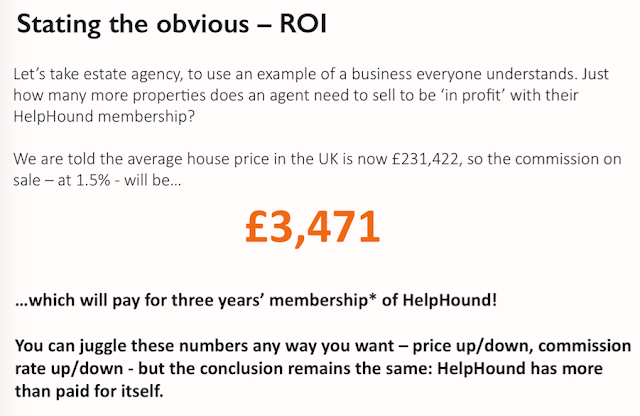 No reviews site here - just professional review management from HelpHound. 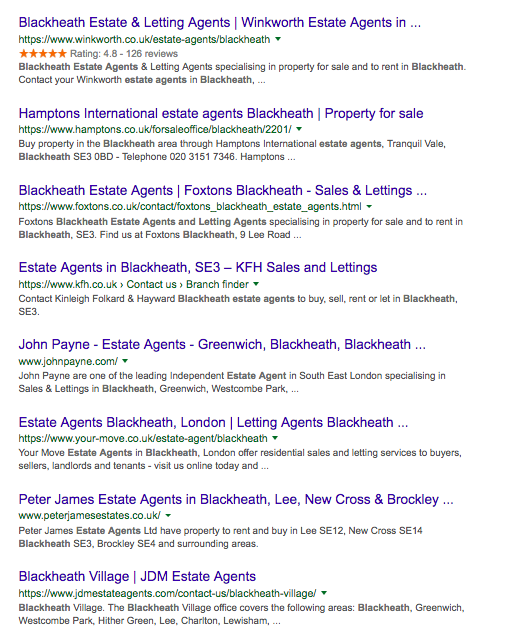 Try this search yourself - and then 'estate agent Kennington' to see the local search results. 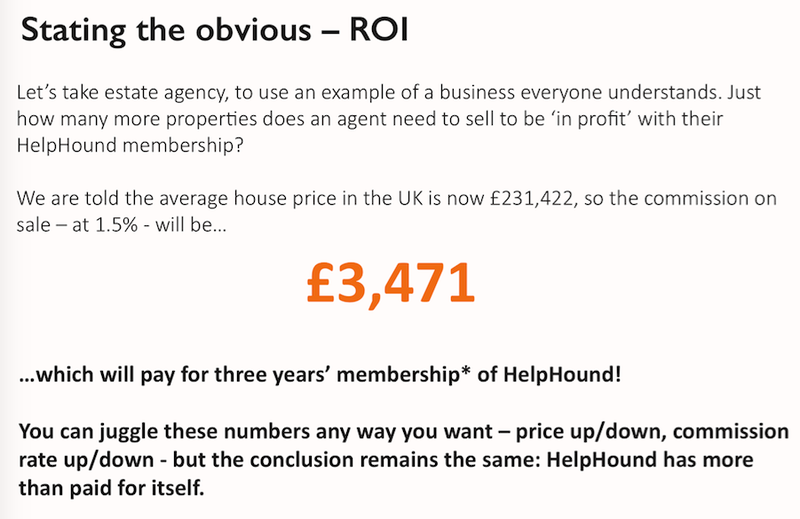 The good news - for businesses in this situation and for businesses new to the world of reviews - is that the solution to everything the reviews sites have promised and failed to deliver is right here at HelpHound. 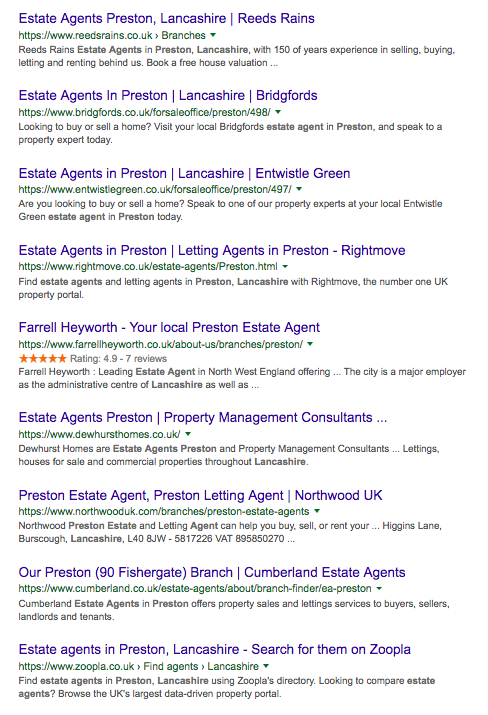 We will get you those stars in search - but the right stars: your own and Google's. We will also ensure that you are not breaking the law and are protected from inaccurate and potentially misleading reviews. Stars in search - the right ones! 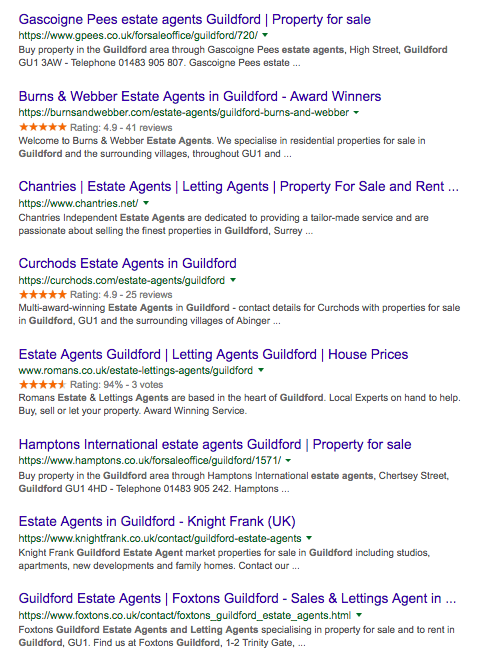 Now - we cannot guarantee that the Google schema (the mechanism that Google uses to pull reviews and star ratings through to search results) will work in every case and for every search term because it is dependent on just how your website is configured but it has to be a very nice bonus indeed! If you would like more detail just read this. Professional review management should find itself placed firmly in the marketing column of any CFO's spreadsheet. And, just like any other marketing spend, it should be valued on the basis of ROI. ...and full-time professional review management. These have a role to play in every business, be they point-of-sale or post sale (commonly initiated by email). 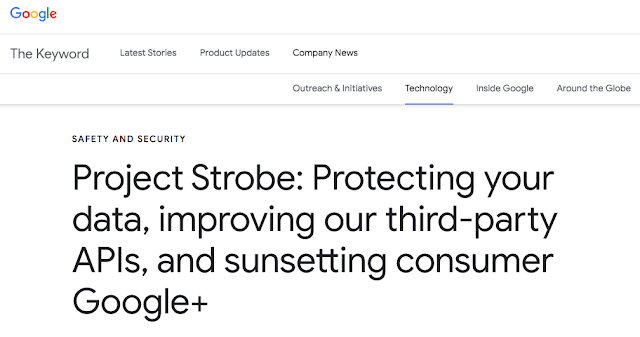 They will be expressly designed to enable the business to refine its offering to its customers, with tailored questions, the answers to which can be analysed to enable the business in question to more accurately target future marketing. As such, there may be no immediately quantifiable ROI. Nor need there be - it will be up to the business to use the information gained to drive that ROI through its marketing. Before the advent of Google reviews these were a very effective way of harnessing the power of tried-and-tested testimonial marketing. They still have their uses where product marketing is concerned (a toaster rated five stars on John Lewis's website will invariably outsell one rated four stars). 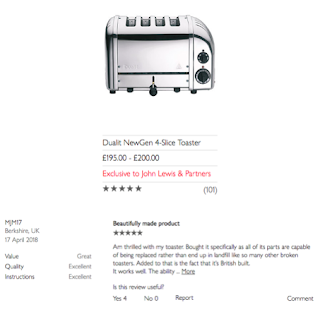 John Lewis (and Dualit) know - for certain - that this ***** rating, and the accompanying reviews like the one below the listing, will sell more toasters. But just how many thousands of toasters did they sell to accumulate those hundred-and-one reviews? That is why service businesses need review management. 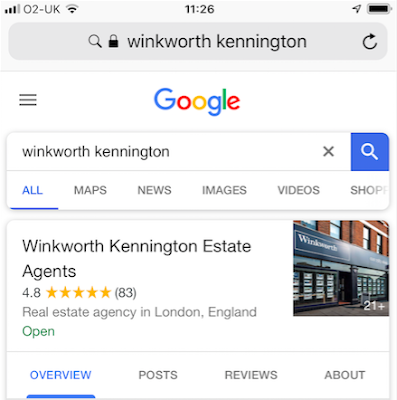 Google also have the added advantage of credibility - everyone recognises Google (and most people now understand that Google reviews are pretty hard to game). ...now, we are not saying these reviews are unrepresentative of the business in question, but we are saying that incorporating moderation would ensure they were. It is vital for complex high-value transactional businesses like estate agency (and legal, financial and medical services) to have a moderation system in place that ensures that the image they present is fair and balanced - for the benefit of future customers who rely on reviews to make their judgement and the business itself. If you are in online retail - selling toasters or by the thousand or computers by the hundred - it is easy to get to critical mass with reviews, but service-based businesses rarely have that kind of put-through. 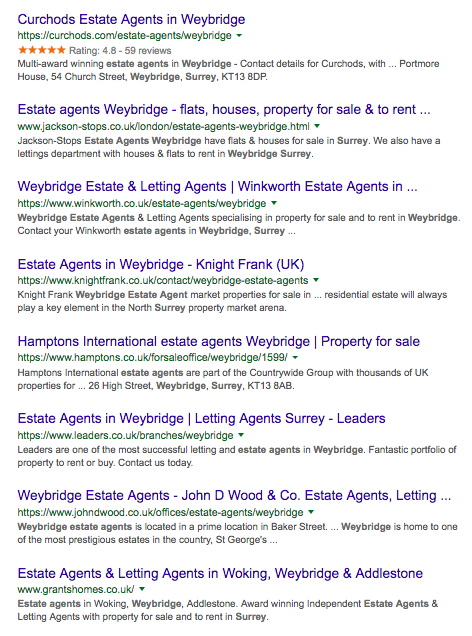 If you are selling houses, providing legal, medical or financial advice or running a recruitment business you are likely to count your customers in dozens a month at the most, often less. This poses a very different question: "How do we get sufficient reviews to make an impact?" There's only one way a service business is going to look like this in search, and that's by employing first-class full-time professional review management. This is where professional review management comes in. With training and support from HelpHound you should expect returns the like of which reviews sites - and feedback mechanisms - can only dream. Our top-performing clients regularly achieve the targets we jointly set at outset. Those targets? We call them 50/50. The other target we set in conjunction with our clients is the score. 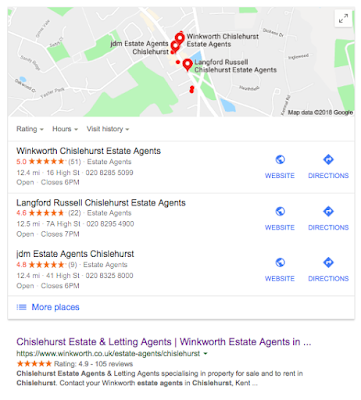 Google have set their filter - the mechanism that enables users to filter out low-rated businesses at 4.5 out of 5 in most areas (in some rural areas the filter remains where it was pre-June 2018 at 4.0) - so we agree a target score, and that is always 4.5 or more. It may well be that, on joining, a business will have to address internal CRM issues in order to achieve that score, and it is part of a professional review manager's role to identify areas for improvement to enable a business to attain that vital score. By now you will be beginning to understand that employing a review manager is about far more than combining a widget on your website with efficient CRM. It is about working together, just as you do with your other professional advisers (legal, accountancy etc.) on a day-to-day basis if need be, to ensure the right outcome. And that outcome? More business flowing through your doors (and, in this context, 'doors' means whatever channel your customers take - website, phone, email, personal visit and so on). So now we arrive at the crucial crux of the difference between 'feedback', 'reviews sites' and 'professional review management'. Quantifiable cash-flow - pure and simple. We know that any business will be able to put a monetary value on those results - because they will know their own conversion rates, and be able to apply £s per conversion. We know you won't be able to factor 'not being fined £X,000 by the CMA' (actually the CMA's last fine had five zeros) into your financial forecasts, but we are sure you will see the value in this, especially when combined with the next way in which we will add value: moderation. Moderation means having an independent entity - HelpHound in this case - reading every review immediately it is written and then enabling a discussion between the reviewer and the reviewed business pre-publication under certain critical circumstances. And those circumstances? If the review, suppose it were published, were to contain any factual inaccuracies or statements that had the potential to mislead any consumer reading them. So: professional review management will earn your business hard cash. 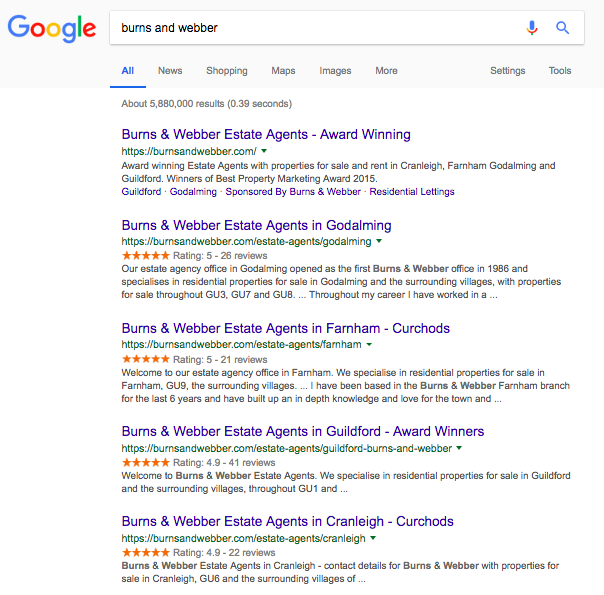 Put it to the test and you won't have to wait long to see the results (the GMB report shown above relates to the first quarter of the client's membership) and, like most other professional services, we won't tie you into any kind of contract either. This is our first 'Monthly digest'. There are now so many articles on this blog that we have decided to introduce a monthly summary; this will include 'News' and 'Perennials', 'perennials' being a 'top ten' of the most important articles. Google announced yesterday that they are 'sunsetting' (their words!) Google+. This will impact few outside the world of tech, where the added privacy was valued by users, and it leaves this sector of the social media field clear for Facebook. Which business is going to be first to be fined for flouting the CMA rules on reviews? 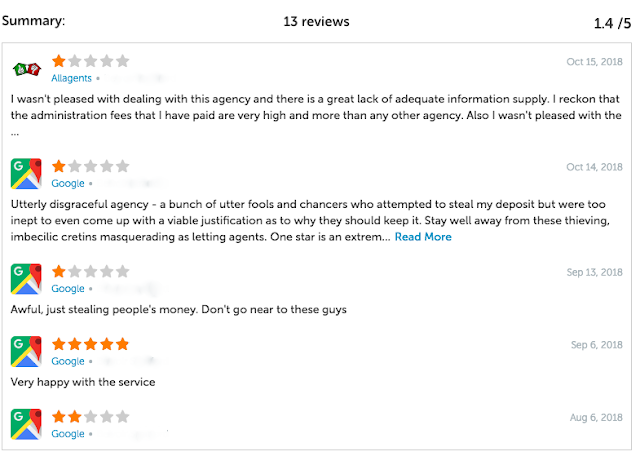 - if your business is hand picking customers to write reviews it might just be in the firing line. Is your Google score hurting your business? The answer, if that score falls short of 4.8 out of 5, is 'almost certainly'. 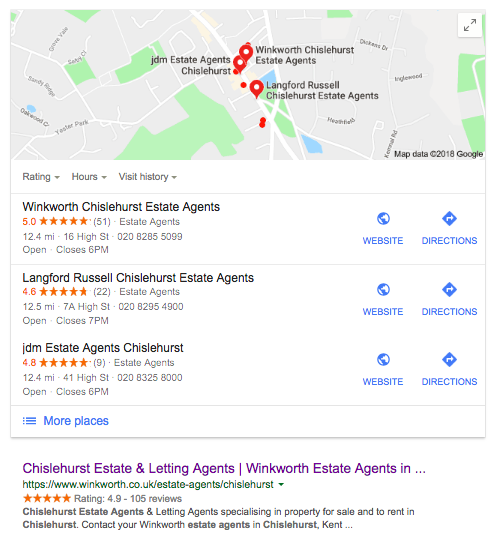 If your business scores less than 4.5 the answer is 'certainly', as it is failing the Google Filter (see article below). Two out of three UK businesses are breaking the law - if you have any doubts whatsoever read this article. 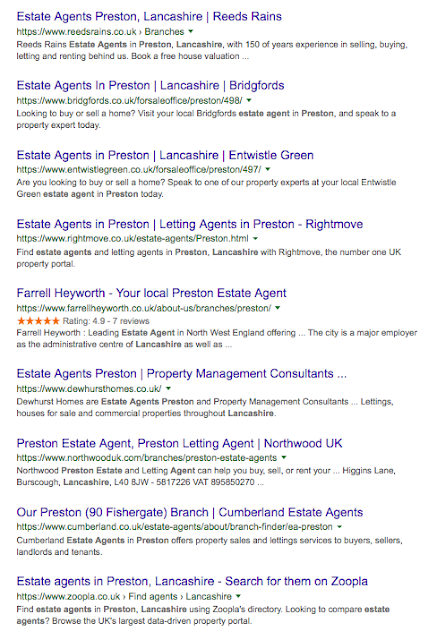 Google or Trustpilot? 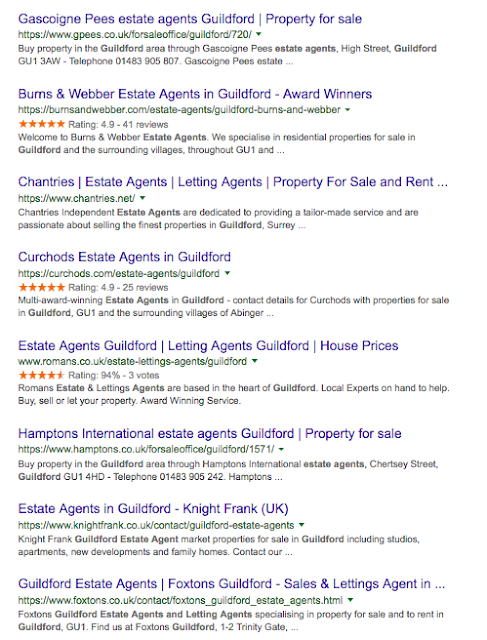 There is sometimes a marked disparity between a business's image on Google and that image as portrayed by a reviews site - which is correct? 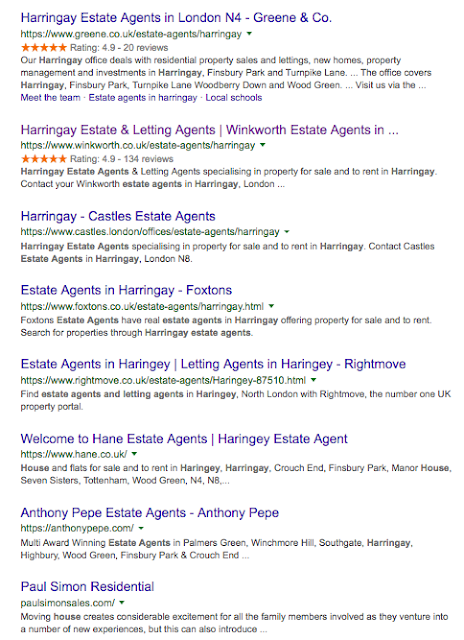 Estate agents only: If your'e paying Rightmove you should at least look good when your potential fee earners arrive on your website. Those new to the world of reviews - and review management - would be well advised to read as many of the following as possible. They are responsible for saving many businesses endless heartache over the years. The single biggest focus for us here at HelpHound is 'results' - enabling our clients to prosper - see the impact of professional review management on a client here. Are you complying with the law? Read this - the CMA's letter to businesses and our analysis. Case histories are always illuminating. 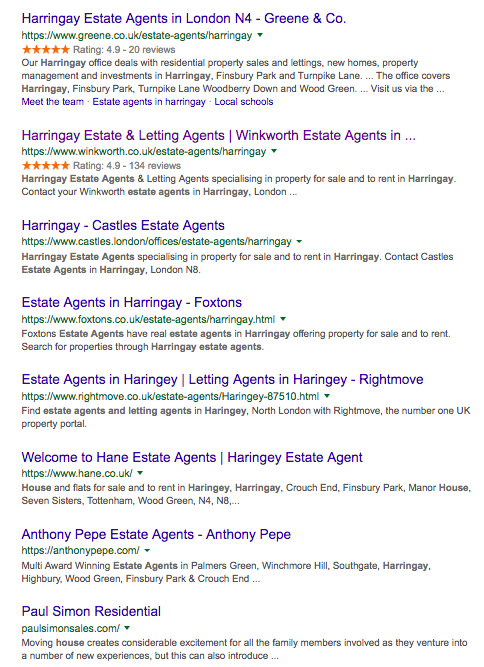 Here's one for an estate agency and here's another for a heating engineer. And the opinions of our own clients? - see what some say here. Independent reviews sites are everywhere you look - good for online retail but potentially disastrous for professional service businesses. If you are considering one read this first. Moderation - and why it is vitally important for every service business that engages with reviews. Deflection - and how it has become an epidemic. 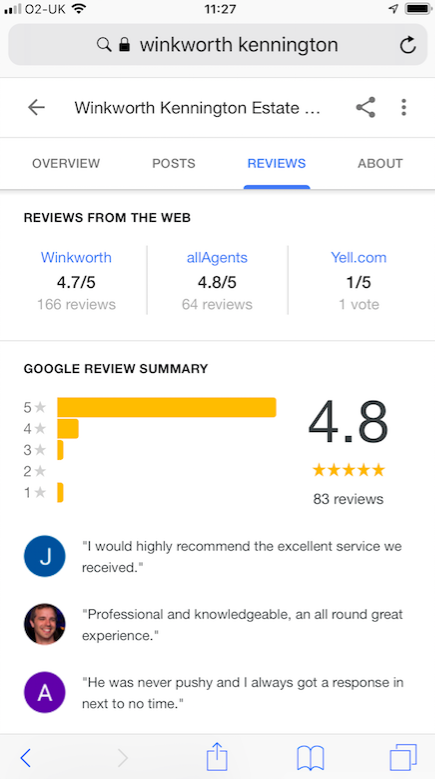 This is all about the increasing trend for unhappy customers of businesses that have a reviews site to voice their opinions on Google. 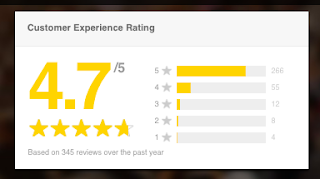 The Google Reviews Filter - it now takes businesses that score less than 4.5 out of search altogether.